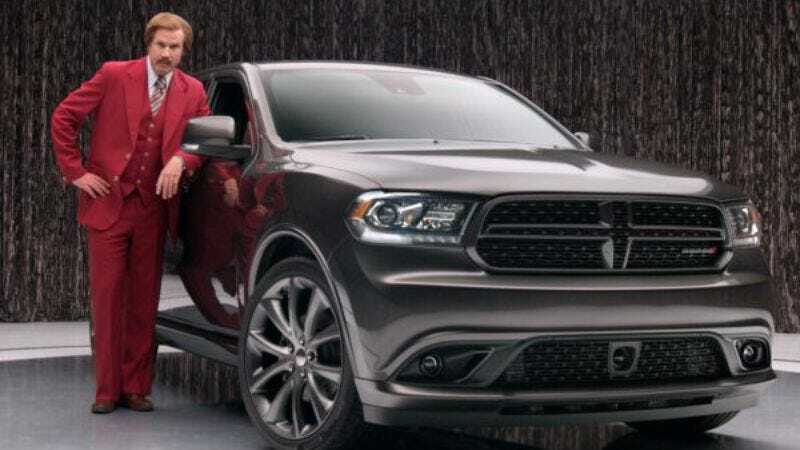 Perhaps you’ve caught some of those commercials in which Will Ferrell, decked out in his Ron Burgundy garb, reads you a compelling and rich endorsement for the Dodge Durango. If not, don’t worry: Unlike his quick-hit Milwaukee’s Best ads, Ferrell recorded 70 of these things, which will be rolling out over the coming months on television, through Dodge’s YouTube channel, in Vines and assorted viral ads, in mountaintop ceremonies with flutes playing and trombones and flowers and garlands of fresh herbs, as Ferrell and the Dodge Durango dance until the sun rises, and then their children form a family band. He made a pretty big endorsement deal, in other words, so you’ll be seeing ’70s icon Ron Burgundy bending the laws of time and space to extol the virtues of a 2014 truck for a while. Maybe don’t wear a bra next time.